Paul has now been released from Charring Cross police station. He has officially reported a crime (misconduct in public office) which the police are now duty bound to investigate and he has provided them with everything they need to investigate the crime. He is now setting off home and should be back in Banbury in a few hours. He is going to celebrate by going for a walk tomorrow. 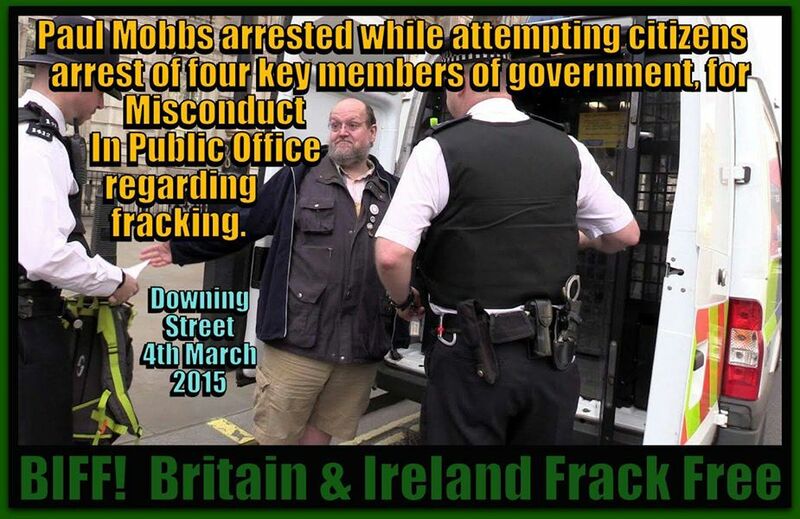 “Around 3pm today Paul Mobbs was arrested under the Terrorism Act (Highways section) for blocking the entrance to Downing Street in his attempt to make a citizens arrest of four key members in the government. He has acted in this way as he believes that members in government are guilty of Misconduct In Public Office in reference to fracking. He arrived with a small team of witnesses and documenters at the entrance to Downing Street at around 11.15 this morning and proceeded to explain his intentions to the police on the gates. At first they ignored him but his politeness and clear knowledge of his rights necessitated that they eventually sent in their commanding officer who was joined quickly by two other officers. He explained that as he has exhausted all other routes for taking action with regards to the fact that his research shows that the crime of Misconduct In Public Office is being committed, he has only one last resort which is to effect a citizens arrest himself. The police took a long time to scrutinise his arguments and there was much going and coming between them and other advisors behind the gates. His arguments were erudite and his temper remained pleasant and non confrontational at all times, as you can see from the photographs. In fact, there was not one officer that he spoke with who did not end up smiling and laughing, particularly when he said that he was going to leap over the fence soon and they responded that he probably was a bit too big and old for that and he responded that, being an avid rambler, he can move “gazelle like” if he wanted. You could see that the police did not want to arrest him as they understood what his plan was. He had on his person all his research and that would have to be admissible evidence in any trial and of course, his research may very well prove that members of government are actually breaking the law. In fact, you could see that over the course of the three hours he was talking with them, many of them were finding his evidence compelling themselves and of course, being on this list, you know how compelling that evidence is. Eventually, he took to stating that he was going to use his body to block any traffic coming in or out of Downing Street. At this point, a police van turned up and he was arrested. As you can see in the picture, he went peacefully. We believe he was taken to Charing Cross police station. We alerted his wife who we had been told to ring as soon as he was arrested. Alice is now key contact and will update us as to what happens next. We are assuming he will be released this evening. 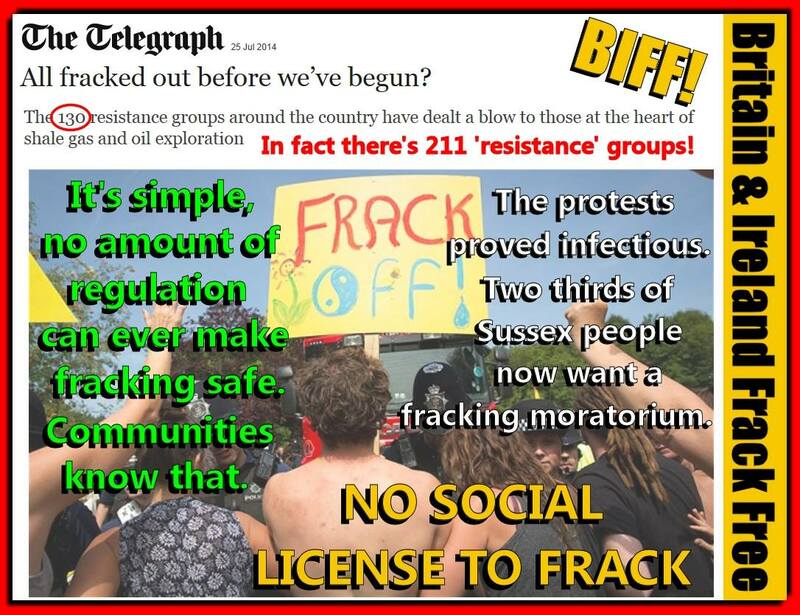 A film of events should be up on the Talk Fracking You Tube site by tomorrow morning.